I’ll never forget the moment. It changed forever the way I looked at art. Madrid, May 2011. 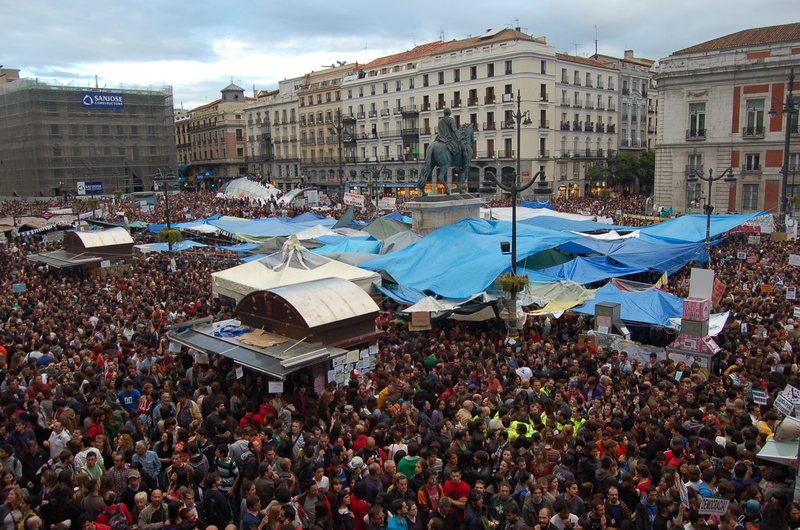 The square, Puerta del Sol, was filling with makeshift tents as “Los Indignados” occupied the centre of Madrid. Coming in on the metro from my college accommodation with a Spanish family, I got off one stop early each day to walk through the square, deliver donations of water, milk or juice to the well-organised communal kitchen area. I tried to understand the posters, the protests, and the petitions, before heading to my morning classes at the language school a couple of blocks away. “Los Indignados” were on the news each night. Our Spanish teachers at the language school commented about what was happening during the daily “culture” session. After class we had free time to explore Madrid, and my feet took me back daily to Puerta del Sol. I didn’t know then that Spain would become my home. 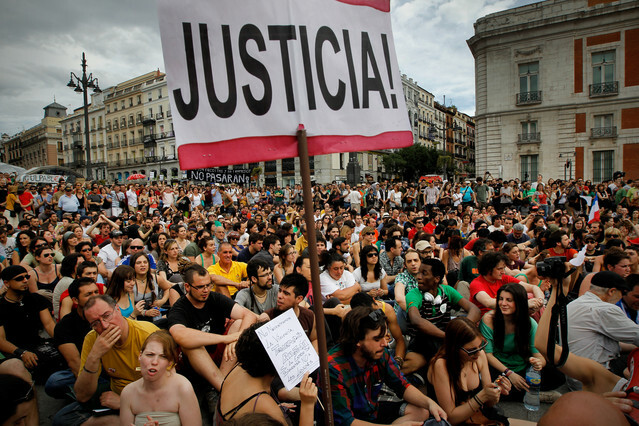 I didn’t know that from the chaos and anarchy in the square would emerge a young political party thatwould change the face of Spain’s two-party system. I didn’t know that I was seeing the emergence of the “Occupy” movement that would spread across Europe and end up outside St Paul’s Cathedral that winter. It was an exciting time to be in Madrid, as something was being created at that moment. And there was more going on in the city. The intensive course was exhausting but there was no time to rest, with all of Madrid to explore. The wonderful Museo El Prado, and the Museo Reina Sofía. After class I lugged a couple more 8-litre water bottles to the protesters’ kitchen, then walked on through the park to Reina Sofîa, where the 20thC Spanish art is housed. The crowds clustered in front of Picasso’s “Guernica” – huge, dramatic, impressive, violent. As expected. I paid my homage to it and moved away from the hordes into an adjoining room. My mind was overflowing with new Spanish grammar and the activities in Puerta del Sol, and wondering whether I had managed the minimum acceptable time to stand in front of Picasso’s masterpiece. Around the corner I stopped dead and stared, open-mouthed. I’d seen this painting in prints but nothing had prepared me for the real thing. Sorolla’s “Niños en la Playa”, the sand and the sea shining, glistening, the light on the naked bodies of the three boys was quite extraordinary. I was rooted to the spot. Beneath each boy lying on the beach, you could see how the pressure of their bodies changed the colour and texture of the wet sand, and their reflections added colour and life to the painting. I couldn’t move. I had never looked so closely at the textures and the brushstrokes of a painting. The light and shade on the bodies and on the sand captivated me. From the depths of my memory emerged the Italian word “chiaroscuro” – light and shade. O-level art in Sydney. Suddenly that word had a purpose. A hundred and two years old, the oil paint leapt from the canvas as if it were fresh from the studio. Four years later and an exhibition called “Días de Verano” (Days of Summer) came to the Museo Carmen Thyssen in Málaga. 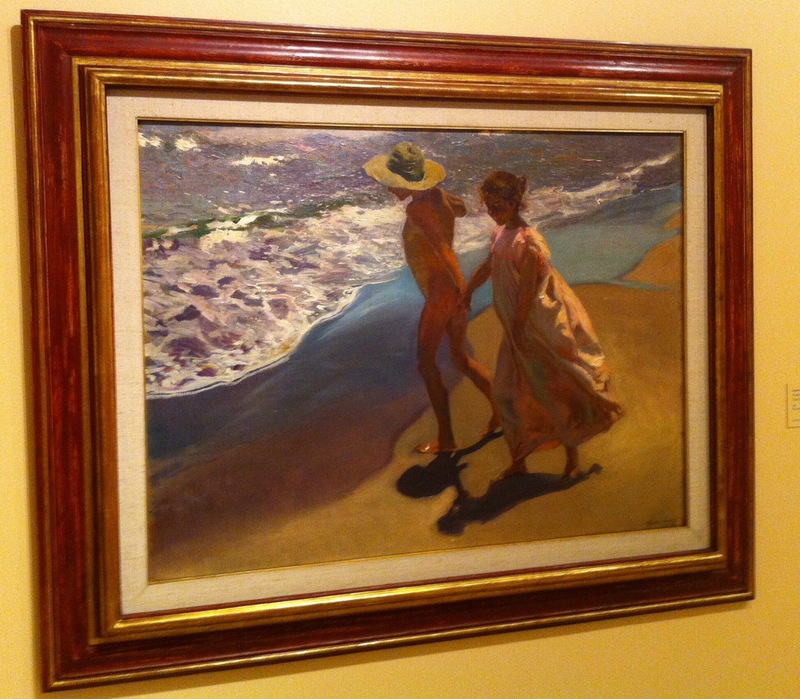 And it features around 30 Sorolla paintings. Sadly not that particular painting, though many more stunning beach and seaside pictures. This summer I have been a regular visitor to the gallery, popping in to gaze at one or two paintings for ten minutes every few days. The art comes alive in front of you, and the glistening oil is as bright and luminous as ever, unchanging. And then last week the music, too, came alive in Málaga’s “Palacio de Deportes” when rock legend Sir Elton John hit town. His voice was as strong as ever, though he avoided some of the falsetto sections, and his energy was extraordinary for his 68 years. As we all piled into the aisles to dance to the last few songs, some Spanish lads were singing along to “Saturday Night’s Alright” with a strange mixture of Spanglish lyrics – “Sábado, sábado, sábado night’s alright, alright alright!”. 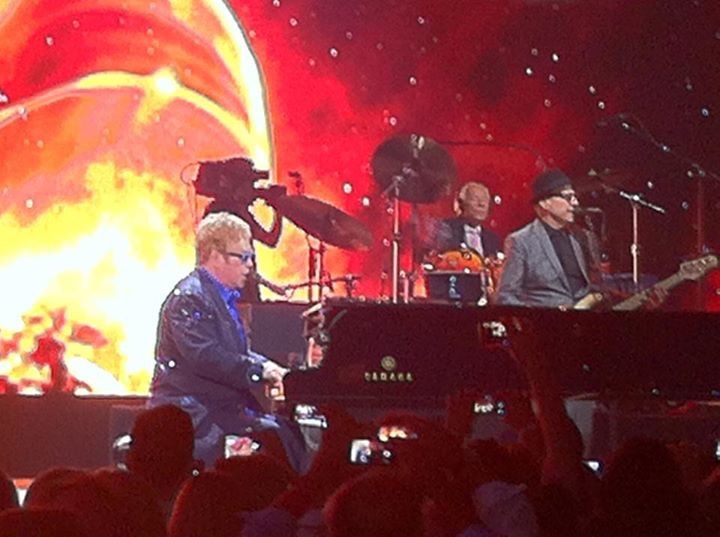 Elton announced that he planned to tour for only a couple more years, and suddenly it felt even more special to have been there, probably the last time Elton would rock Málaga. The music lives on but a live performance is something special, something more than listening to a CD. To be “hopping and bopping to the Crocodile Rock” along with 6,000 people AND Elton John and his band (and some security guards who had given up and were joining in) is an experience that engages all the senses and a memory that will grow in sentimental value as the legendary rocker approaches retirement. 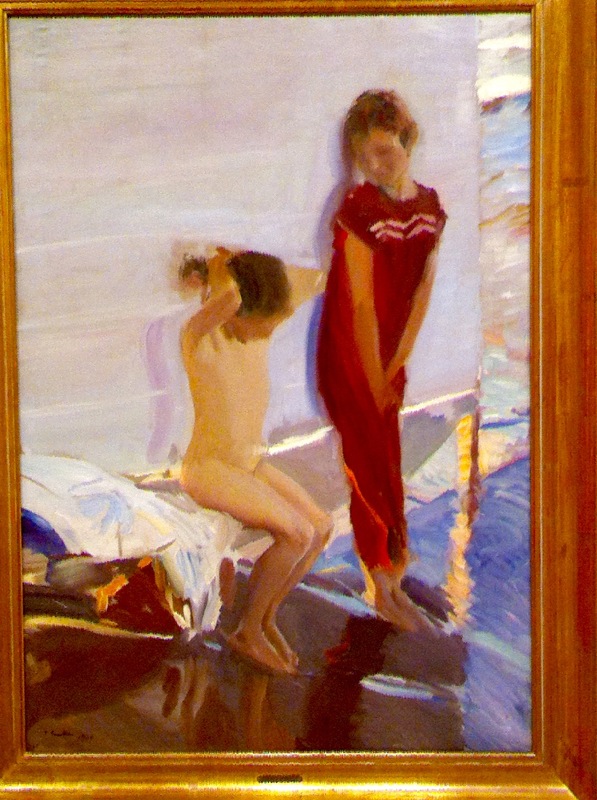 The day after the concert I went back into Museo Carmen Thyssen and gazed at one of my favourites, two children changing into swimsuits. With paintings, time makes no difference. We never needed the artist there to interpret the work. We do that for ourselves, and create our own meanings. Music is a different experience. Being there while the artists sing and play, each performance different in tiny ways, unique. The massive screens showing close-ups of Elton’s hands on the piano, the live audience, the performers’ sweat – it all adds up to something that is of the moment, and can never have the longevity of sculpture, painting, or great architecture. We will still have the CDs, but when the performers are not there to bring it to life, something irreplaceable is lost. The transience adds something to the value of a live concert, yet contradictorily it is the permanence and immutability of great paintings that gives them their value. Either way, being here, this summer, in Málaga, has offered some amazing opportunities. This entry was posted in Spain and tagged Elton John, learning Spanish, Los Indignados, Málaga, Museo Carmen Thyssen, Sorolla, Spain by tamaraessex. Bookmark the permalink. I too love the paintings of Sorolla and was lucky enough to visit the Hispanic Museum in New York last year to see the 14 murals which make up The Vision of Spain collection. One of these murals ( La Pesca de Atun)is reproduced in blue and white tiles in the square in Ayamonte, where we spend time, and that is how I discovered the artist. Friends who have visited the Sorolla house in Madrid, praised the collection of work on display there. why has this excellent blog stopped? Aww thanks Liam, that’s sweet! It hasn’t stopped – it’s been a manic summer and I am just getting back onto the computer. Next blog post due this week – how lovely to be missed!